The new AIDA generation will be taking to the seas in December 2018 in the shape of AIDAnova. The world’s first LNG-powered cruise ship, AIDAnova will be spending her maiden season in winter 2018/19 in the Canary Islands. On December 2, 2018, the new ship will visit the Hanseatic City on the Elbe. From here AIDAnova will head for Gran Canaria where she will be begin her regular cruises around the Canaries. Bookings for this new cruise from Hamburg are now open for the first time. The Four Elements exudes a real sense of the jungle. Surrounded by lush greenery, guests can climb above the treetops or float along the Wild River. For the first time, there will be as many as three water slides on board. Cozy lounge seating offers the perfect spot for daydreaming, while movies and sporting events are screened on the LED wall. Experience and culinary art meld in the new Time Machine restaurant where guests enter a world full of marvels, madness and surprises. During a fantastic dinner trip through time, history and future, reality and fantasy, entertainment and the pleasures of the table all blur together in a magical way. Everything twists and turns; waiters become magicians, conjuring a delicious three-course meal onto the table. It’s a fabulous experience for children too! The Art Club is the multimedia version of the AIDA Gallery, offering an exciting mix of art, photography, videos, games and high-tech. Apart from the works of well-known artists that are on show, guests can also enjoy virtual art using 3D glasses. The bar, designed to look like the lobby of a city hotel, also features handy charging points for smartphones and tablets. Adieu, cold gray routine! And hello, warm, fluffy wellness heaven! The Body & Soul Organic Spa aboard AIDAnova covers an area of 3,500 square meters and offers over 80 of the most beautiful treatments from all over the world. For the first time, the ship has two private outdoor sun islands for special wellness experiences for couples. Another new feature on board is an outdoor sport area with endurance equipment and training areas for morning yoga, pilates and many other sports. And by the way – the Juicy’s & Smoothies Bar at Body & Soul Sport will be serving up deliciously refreshing smoothies and juices made from fresh fruit and vegetables. At the Beach Club, summer never ends. This light-filled piece of paradise, as warm as the Caribbean, is protected by a foil dome that lets the sun in, allows guests to tan, but keeps the wind and rain firmly outside. The new bridge across the waterscape provides a fantastic view of the stage and additional spots for relaxing. The many highlights on board also include the 20 different types of stateroom. The new Penthouse Suite extends over 73 square meters, split across two light-filled decks. Panorama windows and the 20-square-meter sun deck ensure that guests enjoy spectacular views. For the first time, families can benefit from extra space in the Veranda Staterooms Deluxe on Decks 15, 16 and 17, right beside the Four Elements and the Kids Club. The suites, with separate bedroom and a walk-in closet, can accommodate up to five people. The Junior Suites with their light-filled conservatory are also a new feature. The new and cozy Single Staterooms are available as indoor staterooms or even with a balcony. With a total of 17 restaurants, AIDAnova offers hitherto unprecedented culinary diversity. Popular classics are complemented by new trends from all over the world. That’s the case, for example, on the Street Food strip. At “Brot & Stulle” guests can enjoy tasty filled baguettes and rolls, or savor the best currywurst on the seven seas at the “Scharfe Ecke.” Or how about a doner kebab? The Street Food strip is open almost around the clock and we think it’s going to be a massive hit. At Best Burger @ Sea it’s favorite burgers all the way – because the guests can put together their own custom burger choosing from a wide range of ingredients and home-made sauces – using tablets at their table, or by smartphone. Thanks to the impressive multimedia projections, guests at the new Ocean’s fish restaurant will get the feeling that they’re actually in the ocean, gazing at its treasures without a care in the world. Churrasco means meat skewers that are grilled over an open flame or charcoal. It’s a Brazilian national dish that will in future be served up at the Churrascaria Steakhouse. The “cortadores” slice the meat directly from the skewer at the table. Barbecues will be held on the terrace. At the Ice Cream Factory guests can enjoy so much more than just chocolate and vanilla. We’re talking here about a real passion for ice cream which is made on board using the best natural ingredients – with irresistible flavors and new varieties every day. The diversity of Asian cuisine will be celebrated on board AIDAnova at numerous restaurants. At the new Teppanyaki Grill, guests sit together in a sociable circle, adding their desired ingredients to a pot that is sunken into the table. The end result is tasty soups and stews. Guests choose their ingredients and they are freshly prepared on hot teppanyaki plates. A new highlight at the East Restaurant is an original tandoori oven in which traditional Indian dishes are prepared. Those who prefer something more rustic can look forward to the cozily traditional Brauhaus microbrewery which, for the first time, will feature a spacious beer garden with a view of the ocean. The fresh ocean air will whet appetites for the hearty specialties and fresh draft beer from the ship’s own brewery. 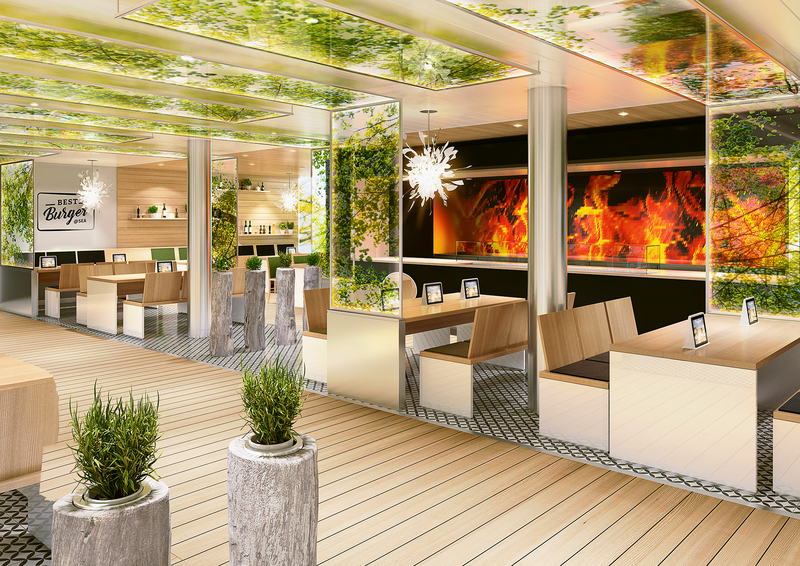 The new bars such as the French Kiss Bar, the smart Rossini Bar, the Tokyo Bar or the South American-inspired Vinothek are the perfect complement to the onboard restaurants. AIDA Cruises’ world-class entertainment is being enhanced with new formats that will involve the guests even more than before. Surprising and extraordinary entertainment options, produced exclusively by and for AIDA, are certain to keep guests well entertained. At Studio X, the guests are there live and right in the thick of things. This is the first TV studio at sea where shows are produced and broadcast. Up to 500 studio guests can get a close-up look and join in when game shows, comedy, cookery shows, well-known TV formats and workshops are made. In the evenings, the seating stands are rolled to the side, and the studio is transformed into a dance floor. Those whose eyes glaze over at the sound of Neil Young, and who turn up the volume when they hear the Rolling Stones or the Kings of Leon, will love the new Rock Box Bar. They can enjoy the finest live music in a cozy pub atmosphere. Those who are feeling brave can become stars themselves at the karaoke, or guests can display their music knowledge at the rock quiz. The Cube – the in place for night owls – is super stylish and glamorous. Guests can dance into the early hours, meet new people, and enjoy chilled drinks at the bar. During the day the disco is transformed into a “school” for cocktail and dance workshops. AIDAnova takes travelers to fascinating destinations around the world – and she also makes a contribution towards preserving the beauty of the oceans and our planet. AIDAnova is the world’s first ship that can be powered entirely with environmentally friendly liquefied natural gas (LNG). This reduces nitrogen oxide emissions by up to 80 percent, and CO2 emissions by a further 20 percent. AIDAnova cruises can now be booked at travel agencies, at the AIDA Customer Center by telephone at +49 (0)381/202 707 07 or at www.aida.de. More information and videos at www.aida.de/genaumeinurlaub.